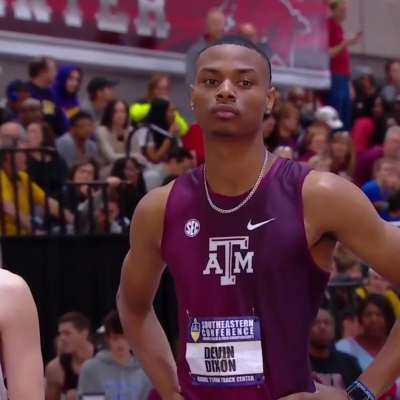 EUGENE, Ore. — Ajee’ Wilson, watch out. 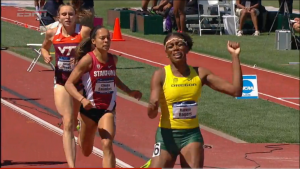 The US officially has another young 800m sensation as 18-year-old Oregon freshman Raevyn Rogers ran 1:59.71 – her first career sub-2:00 (previous pb 2:01.67) – to win the women’s 800 at the 2015 NCAA Outdoor Track and Field Championships at Hayward Field. 1:59.71 makes Rogers the third-fastest US junior. Stanford junior Claudia Saunders was best of the rest in 2:00.63 – a new school record. Virginia Tech’s Hanna Green (third, 2:01.17) and Arkansas’ Chrishuna Williams (fourth, 2:01.67) also broke 2:02 in this one. Clemson’s Natoya Goule, the 2013 NCAA outdoor champ who also was indoor champ in 2013 and 2015, faded to sixth (2:05.19) after leading for the first 600m. 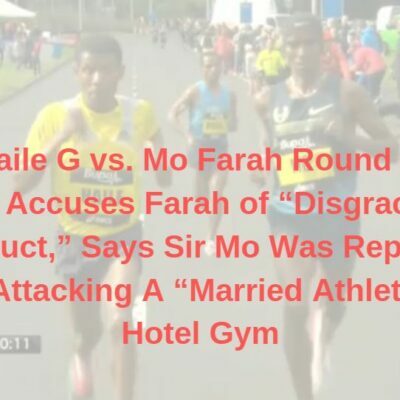 As expected, Goule took this one out fast – perhaps too fast. Goule ran the first 200 into the wind in 26.72 and had a huge lead at 400 (56.17) as Rogers hit the bell in second in 57.79. By 600 (1:28.75 for Goule and 1:29.29 for Rogers), it was clear that Goule was in big trouble. Goule would crawl home the last 200 in 37.02 but there was no stopping Rogers as she’d acclerate from a third 200 of 31.51 to a 30.42 coming home. Rogers passed Goule halfway around the final turn and then pulled away from Saunders in the last 60. 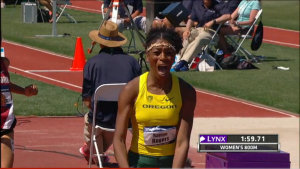 Once across the finish line, Rogers was exuberant as she punched the air as the Oregon crowd went bonkers. Quick Take #1: Rogers somehow has avoided the media glare until now but she’s clearly a prodigy. Unlike US junior record holder Ajee Wilson (1:58.21 at 19) or US junior #2 Mary Cain, who ran 1:59.51 at age 17 and has been in the media spotlight for years, Rogers somehow has stayed a bit under the radar – until now. Rogers’ progression over the years has been a bit uneven but she’s put up some ridiculously fast times at ridiculously young ages before. Check out her progression and how it compares to 21-year-old American Ajee Wilson, who was ranked #2 in the world last year. Quick Take #2: Despite Rogers’ huge celebration, she said she wrote down her goals in a notebook way back in August at the request of her coaches and the goals included both being Pac-12 and NCAA champ. After the race, Rogers also revealed that she’ll run some more this summer. She’s not sure if she’ll run USA Jrs or Seniors or both. 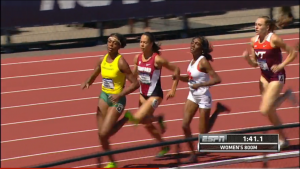 Quick Take #3: This was a turnaround for Stanford’s Claudia Saunders, who was just 4th at the Pac-12 meet. 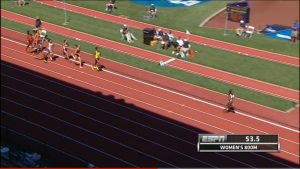 Yes, the Pac-12 is strong in the 800 but Saunders ran her best when it mattered most, and check this out, it’s the second straight year in a row that she’s gone from 4th at Pac 12s to 2nd at NCAAs. Very impressive. 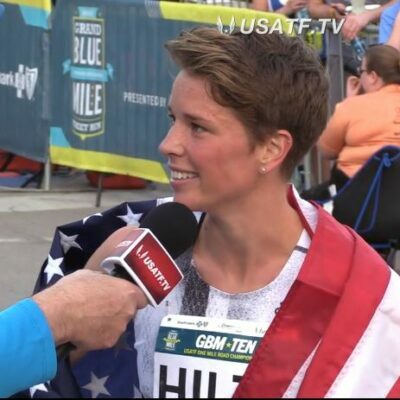 Saunders said that she runs well at NCAAs because Stanford coach Chris Miltenberg keeps her in more 1500 training until May rolls around when they work on speed. The biggest difference between her 2nd-place showing last year and this was the time. Last year, Saunders only ran 2:02.92 for second and only had a 2:02.68 pb. 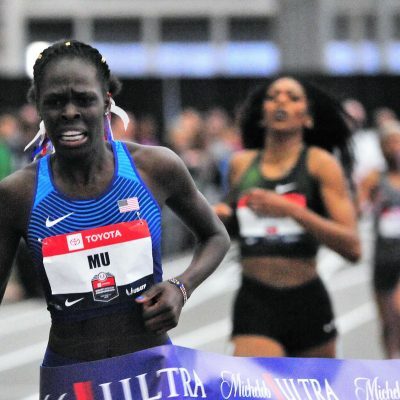 This year, she’d already run 2:01.79 coming in. Quick Take #4: Natoya Goule fully acknowledged she went out too hard in this one. The stats back her statement up. 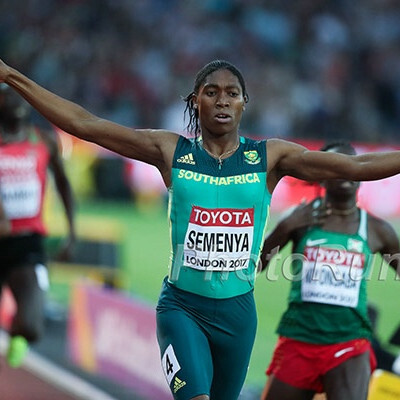 Indoors, Goule barely held on when she went out in 27.08 and 56.63 as she won the title in 2:01.64. 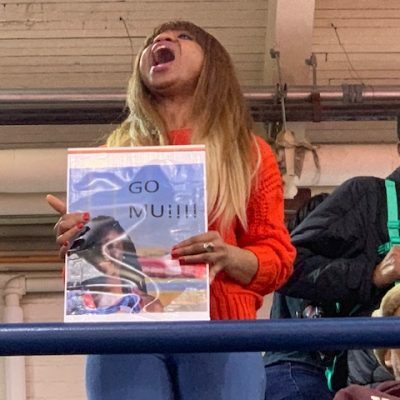 This afternoon, despite the fact that she was running into a headwind on the back stretch, she went out even faster for the first 200 (26.72) and 400 (56.17). 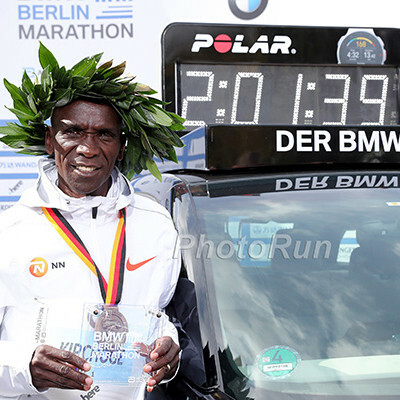 Her first 800 today was actually only one-hundredth of a second (.01) slower than what the men’s 800 runner Edward Kemboi ran yesterday. This was her final college race but she’ll be staying in South Carolina to train with coach Mark Elliott.